At the Charles W Howard Santa Claus School in Midland, Michigan, some two hundred Santas and Mrs Clauses came from across the US, Canada, Denmark and Norway to learn wood toy-making, brush-up on storytelling skills, drive sleighs, feed reindeer and, most importantly, spread the Christmas spirit. “It’s the Harvard of all Santa schools,” Schneider, a retired crane operator, said of the school, which was established in 1937 and made a non-profit organisation in 1987 by directors Tom and Holly Valent. “It’s a privilege to be Santa,” Tom said, sitting in a tall wooden chair with a “Santa” engraving and green velvet upholstery. The organisers also said there was a record number of Mrs Clauses in 2016. “What a great place to find a husband!” one Mrs Claus joked. “Kathy has always collected Santas and I have always had a beard,” said Bill. “We decided it was something we both wanted to do,” said Kathy. The sweater Kathy made for Bill symbolised their love for Christmas. “It had reindeer on it,” Kathy, who also sewed her husband’s Santa suit, said with pride. “And it still fits!” Bill chimed. Over the three days, the couple struck silly yoga poses, practiced breathing techniques and broke out in song. The school fitness teacher had them dance as if they were wrapping presents, baking cookies and filling stockings to classic Christmas tunes like Jingle Bells and Santa Claus is Comin’ to Town with the rest of their classmates. 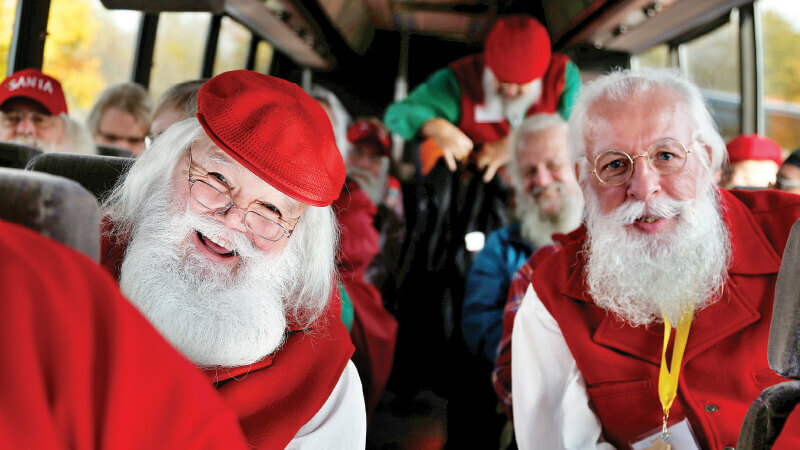 “We even learned sign language,” Bill, a loyal member of the International Brotherhood of Real Bearded Santas, said. “It’s important to be able to spread Christmas cheer to all children,” he added. “The toughest part for me is keeping my hair white,” Schneider said with a laugh. Santa Fred Osther, 80, who travelled from Oslo, Norway to attend this year’s training, looked like a Norwegian gnome with his red pointy hat as he shopped around the kids section looking for toys.